Dr Juan Deseta completed his medical degree at the University of Witwatersrand, South Africa in 2005. He then completed his internship and community service at Groote Schuur Hospital, Red Cross Children’s Hospital and Victoria Hospital, Cape Town and went on to complete an elective at the Royal Infirmary of Edinburgh. Dr Deseta then completed a Diploma in Ophthalmology of the College of Ophthalmologists of South Africa: Dip Ophth(SA) and moved to Port Elizbeth to the Ophthalmology Department of Uitenhage Provincial Hospital. 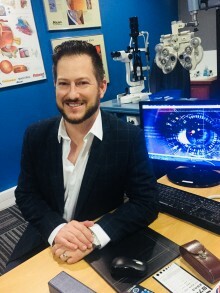 After two years Dr Deseta transferred to Port Elizabeth Provincial Hospital and then completed his Fellowship of the College of Ophthalmologists of South Africa: FC Ophth(SA) in conjunction with Groote Schuur Hospital , qualifying as a specialist Ophthalmologist. After his 4 years at P.E Provincial Hospital, Dr Deseta moved into private practice; he partnered with Dr Jan Venter and in 2017 joined the practice at The Eye and Laser Institute. The practice covers all fields of Ophthalmology and with a focus on new innovations in improving eye health and surgical outcomes, offers cataract surgery, LASIK, glaucoma and diabetic eye disease treatment as well as general Ophthalmology. The practice prides itself on superb surgical results and a warm, friendly atmosphere. With a special interest in cataract surgery, Dr Deseta continues to attend both local and international Ophthalmological congresses in order to integrate the most up-to-date technology and techniques into the practice. He also consults weekly in both Uitenhage and Jeffrey's Bay.